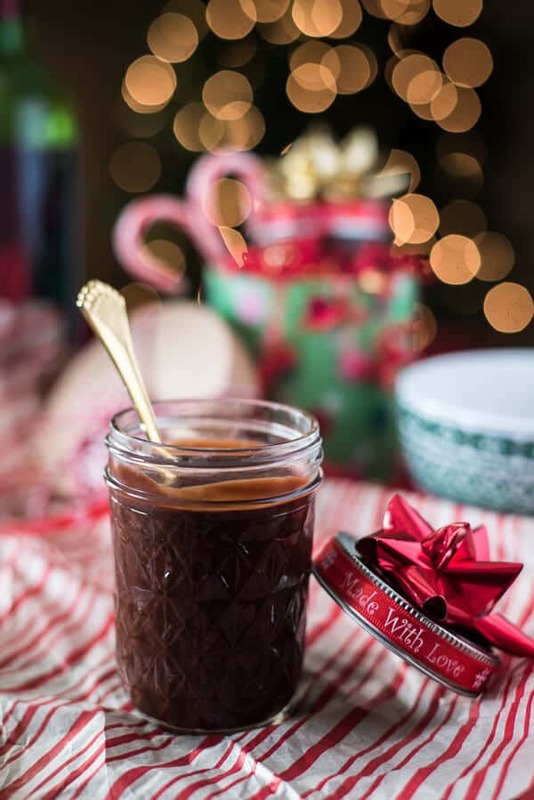 Red Wine Hot Fudge Sauce is a great gift for chocolate and vino lovers alike – perfect for those bowls of ice cream that just need a little extra something special! Just like that, it’s out with the turkeys and fall leaves – headfirst into Christmas music, twinkly lights, and peppermint everything. And I couldn’t have my arms open any wider for all of it! Seriously, as much as I wax poetic about my love for fall and the season change, I’m even more enamored with the Christmas season. I’ve always been a big fan of all things red, green, and snowflake thanks to my years in high school performing in Disney’s Candlelight Processional, followed by my yearly college concert choir Christmas Madrigal. The season holds a special, magical place in my heart, but I credit my husband for truly waking up the rabid holly jolly monster in me. Confession time: I really, truly love to bake. I know, GTFO, right? In case the name didn’t give it away, I find peace and joy among the flour and sugar and science of sweets and confections. If someone told me I could drop everything and spend 8 hours a day in my kitchen baking up a storm for a living, I’d do it in a heartbeat. There is nothing in the world quite like hearing the happy, content sounds of someone enjoying something delicious that you made with love. Alas. Chocolate chip cookies don’t pay the bills. Well, actually…they do for me, but only cuz it’s corporate. Toys break, clothing rips. Electronics get replaced a couple of years down the road with something faster and brighter. Fuzzy socks and blankets lose their comfy-ness. Homemade, edible gifts may be something short-lived and fleeting, but they’re some of the most memorable presents we can receive. The memories surrounding those kinds of gifts are ones that are stirred every time the holidays come around, especially when the person who gifted them can’t be with you. And even when you try to recreate those gifts and they don’t quite come out the same way? Your heart and mind are satisfied that they’re still somehow with you while you lick the cookie batter from a spoon as you watch the final product rising in the oven. This hot fudge sauce was a new horizon for me. I’m pretty no-fuss when it comes to eating ice cream. 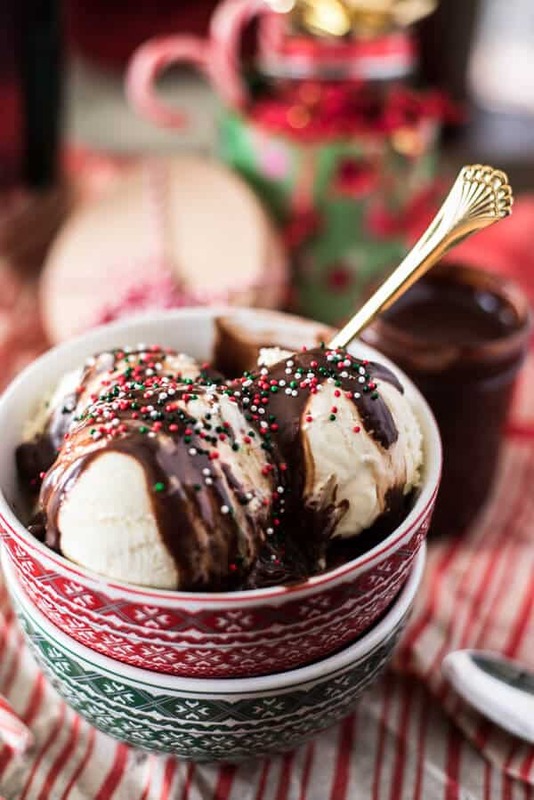 My motto is “if it comes in a container I can stick a spoon in, I’ll eat it as is.” I enjoy a sundae every now and then, usually preferring caramel or strawberry sauce (my absolute #1 ice cream topping) to hot fudge. 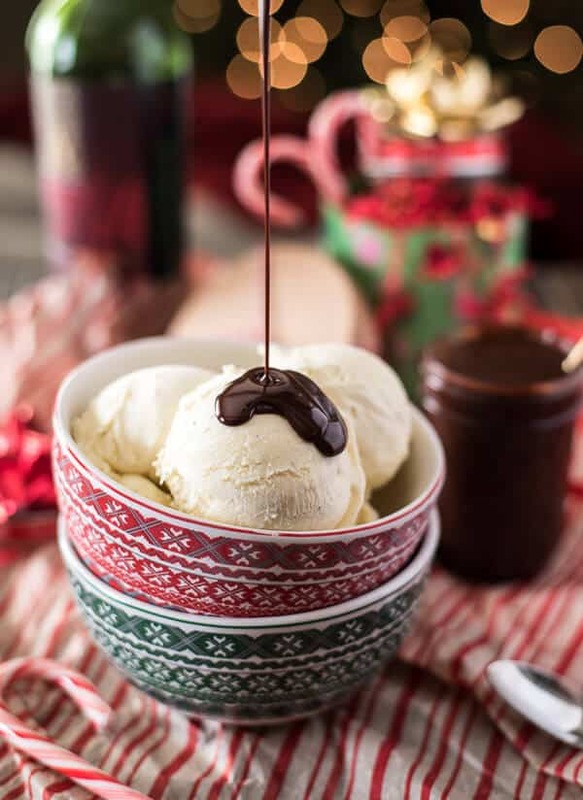 The irony of gifting an ice cream topping during winter is not lost on me, but you would be shocked at how much ice cream people eat in Florida this time of year. Maybe it’s like that everywhere – is it? 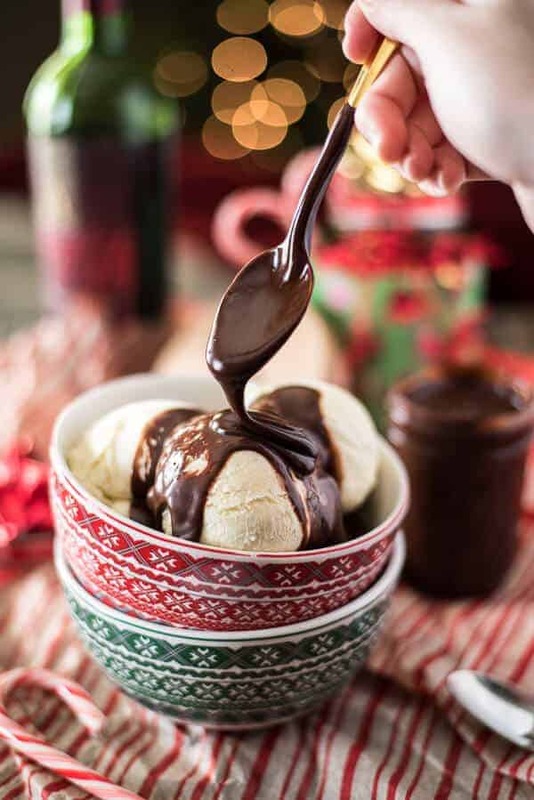 If folks in your neck of the woods love a good ice cream sundae in freezing temps, then this snazzy Red Wine Hot Fudge Sauce is just about the easiest, quickest gift you can give ’em. I advise against shipping it for obvious reasons, but a good old-fashioned hand-delivered package with a gallon of ice cream to go with it will leave a mark – and you’ll probably even get invited to share in the fruits of your labor. Of course – you can make this stuff in July, too. Don’t let the festive colors deter you. 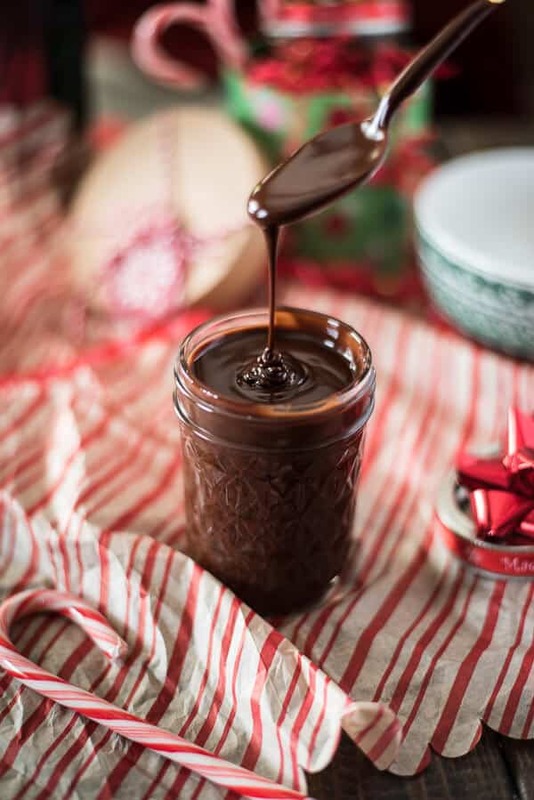 In a heavy saucepan, bring cream, wine, syrup, sugar, cocoa, salt, and half the chocolate to a boil over medium heat. Reduce to simmer and cook for 5 minutes, stirring occasionally. Remove from heat and stir in remaining chocolate, butter and vanilla; stir until smooth. Cool the sauce for 20-30 minutes to warm before serving, allowing it to thicken. Sauce keeps in fridge for 1-2 weeks. Reheat 10-15 seconds before serving so that it is thick but still pourable. Homemade gifts are a creative, delicious way to surprise friends and family for the holidays! Find your perfect gift below, courtesy of the Sunday Supper Tastemakers! Chocolate, Caramel and Cranberry Biscotti by What Smells So Good? 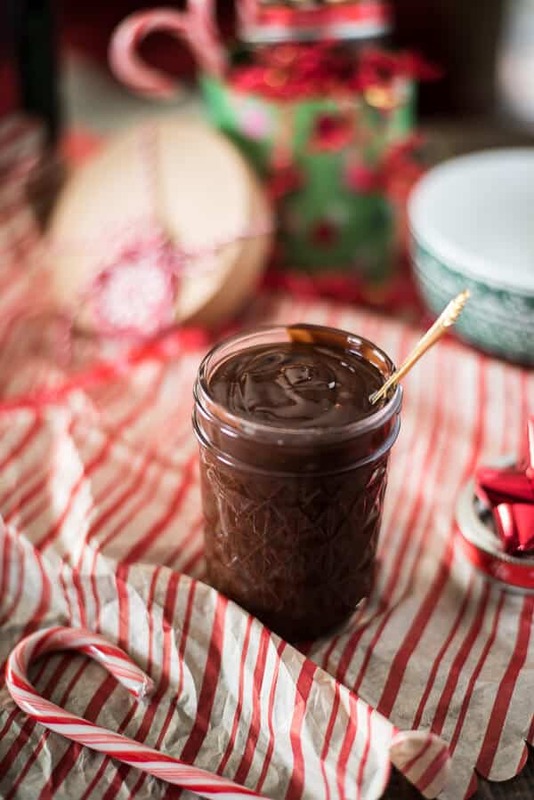 Receiving a jar of homemade hot fudge would thrill my family!!! So thick and luscious! This idea is awesome of course and I love your photos! This looks delicious!! I bet Mom would love some. I should send her a jar. Beautiful photos! That touch of wine sounds like a great add in! Red wine and chocolate is one of my absolute favorite flavor combinations. I wouldn’t even need the ice cream, just a spoon and a quiet corner.